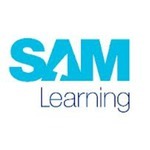 SAM Learning provides award winning proven online subscription services used by over 60% of Secondary Schools and 1,200 Primary Schools across England to improve results at Key Stage 2 and 3 SATs and at GCSEs. Last year alone, almost 1 million pupils used SAM Learning! SAM Learning provides carefully prepared revision exercises and test-style questions for Key Stage 2, Key Stage 3 and GCSE. Pupils complete and mark their work onscreen and with supporting guidance from subject examiners, students develop a strong revision habit and improved test technique across the curriculum. Independent research by the Fischer Family Trust based on results of over 400,000 learners, shows SAM Learning services improve results at GCSE, KS3 and KS2. With an ever expanding service 2007 saw the launch of the new Flash based Improve Activities and new interfaces. Many Local Authorities are selecting SAM Learning as a key strand of a school improvement strategy with both Primary and Secondary School programmes. Schools pay a subscription depending on the size of the school for the service. This allows all students/pupils access anywhere at anytime.